Holiday Special ~ 1 Dozen Stakes! 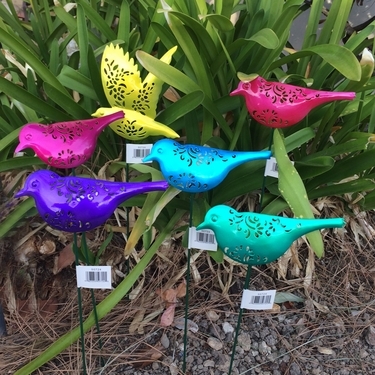 A set of beautiful Filigree Birds Garden stakes to add whimsical color and fun to your home and garden! Made of metal and painted with bright UV protected paint and lacquer coated. Laser cut patterns for added design, each bird connects to the stake with a small spring to give a little movement in the wind. These simple design silhouettes will bring plenty of joy to your yard. Set includes 6 unique stakes (two of each).